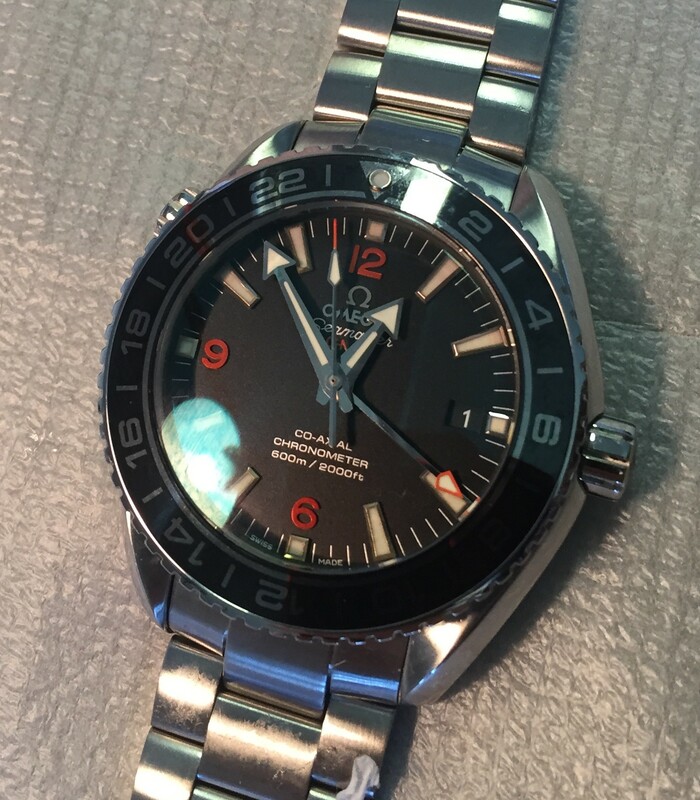 In the previous post, I waterproofed Planet Ocean GMT with DG2813 movement. 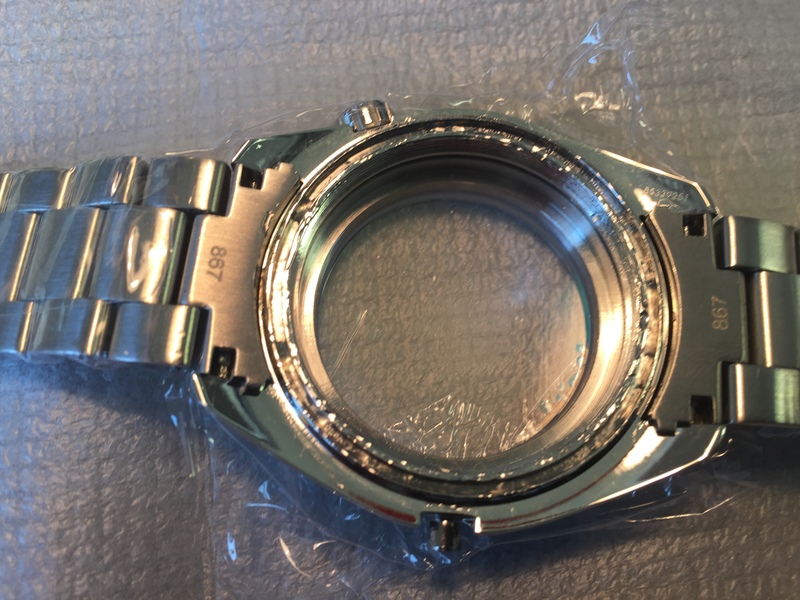 The ETA2836-2 PO GMT Replica Waterproofing is the next step. Before I start, a few general comments – I looked in the forums on how to spot an Asian ETA movement. This is a comprehensive, fairly recent post. Either the Chinese have gotten a whole lot better in replicating the ETA’s, or this is the ‘real’ thing. How do I know? 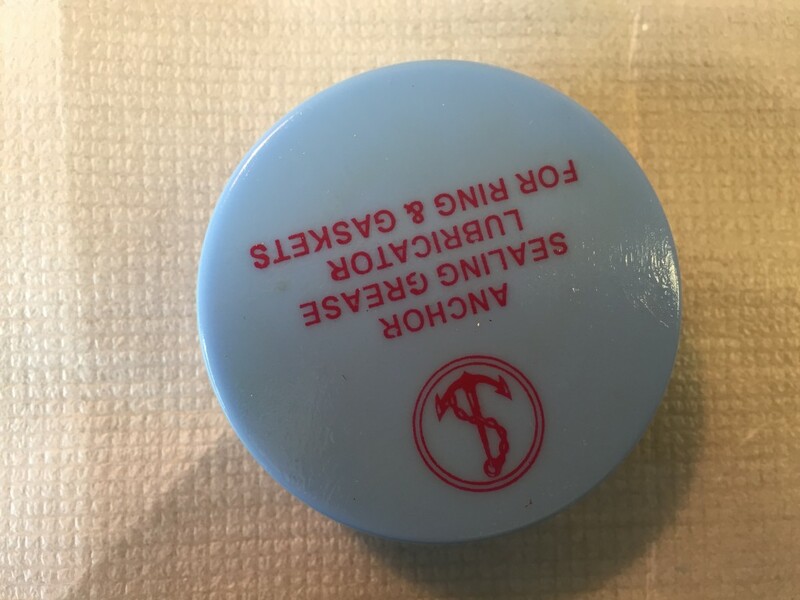 The ETA seal on the ebauche is legible. The + and – signs in the micro adjuster are etched and not stamped. The finish on the wheels is not shiny. Hmm… Well, whatever, this is still a replica one way or another. 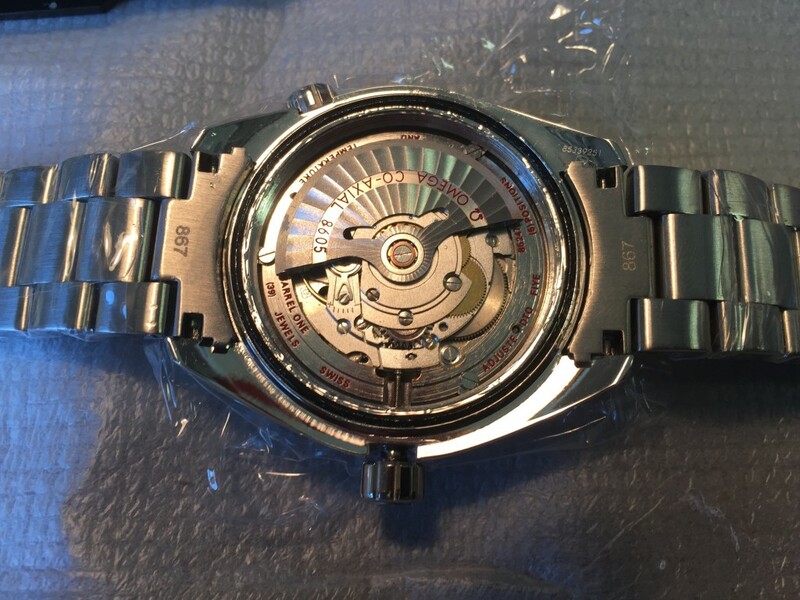 It certainly is not a coaxial movement, it does not have a silicon wheel or main spring (as the Omega 8500 calibre and its variations have). It is an exceedingly nice replica, though, and a lot better than the cheaper one I got. 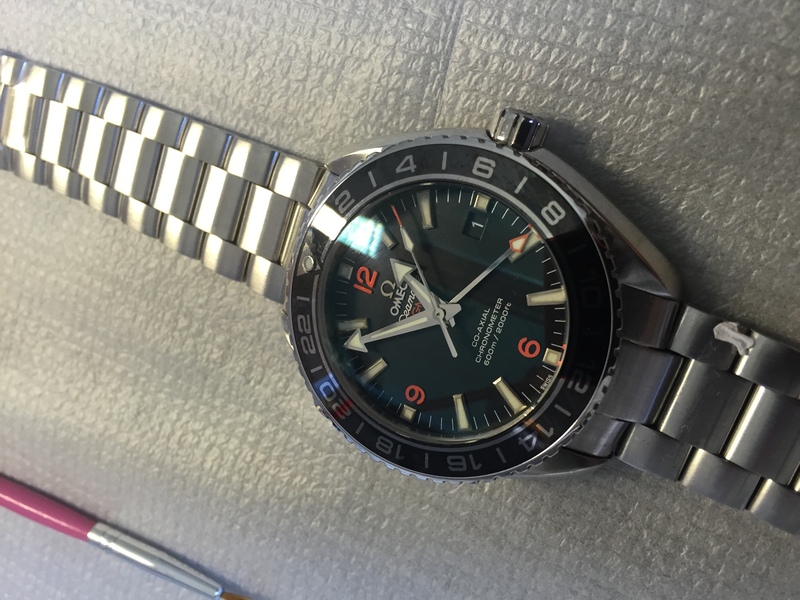 Still not as nice as the genuine Omega and the watch has certainly been assembled in a dirter environment, compared to the gen, but it is still very nice. I need to do pretty much what I did with the DG2813. 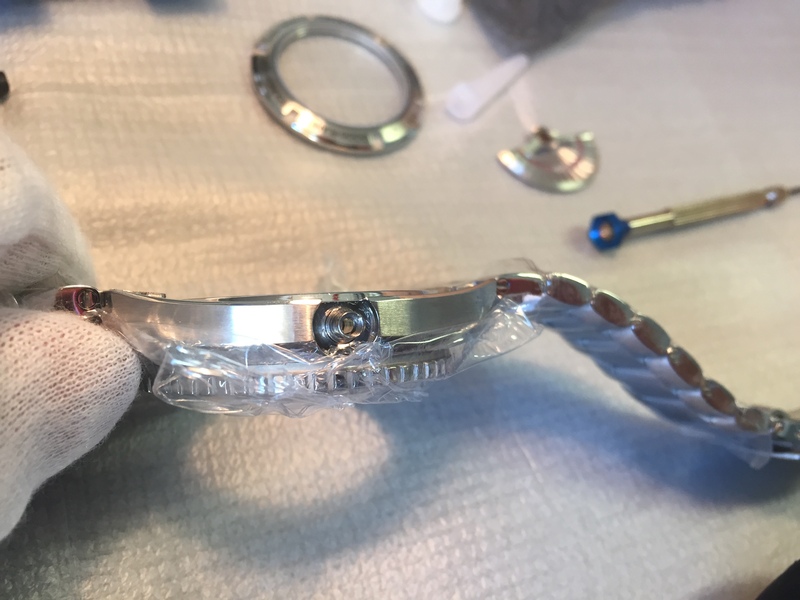 The only difference is that now I know how to get the movement out, so I will be sealing the front crystal too. I start by organising the workbench. 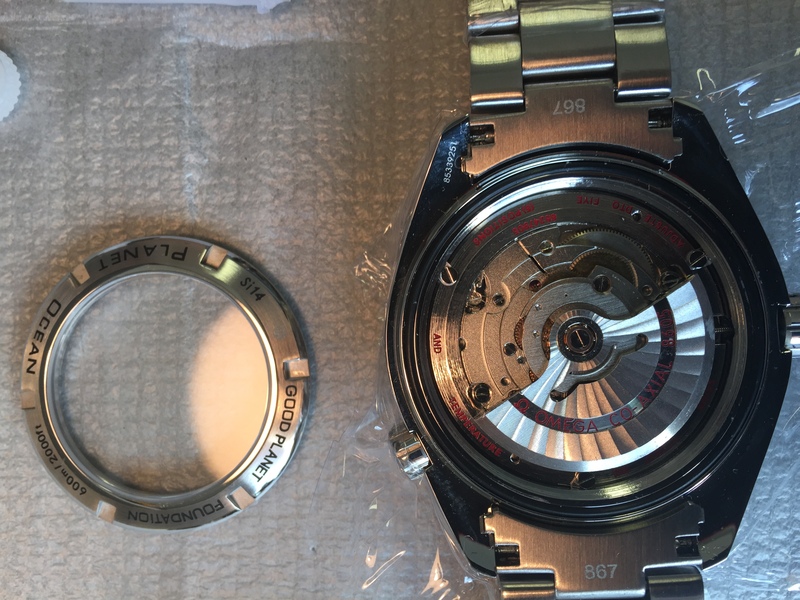 I open up the watch with the Jaxa wrench. 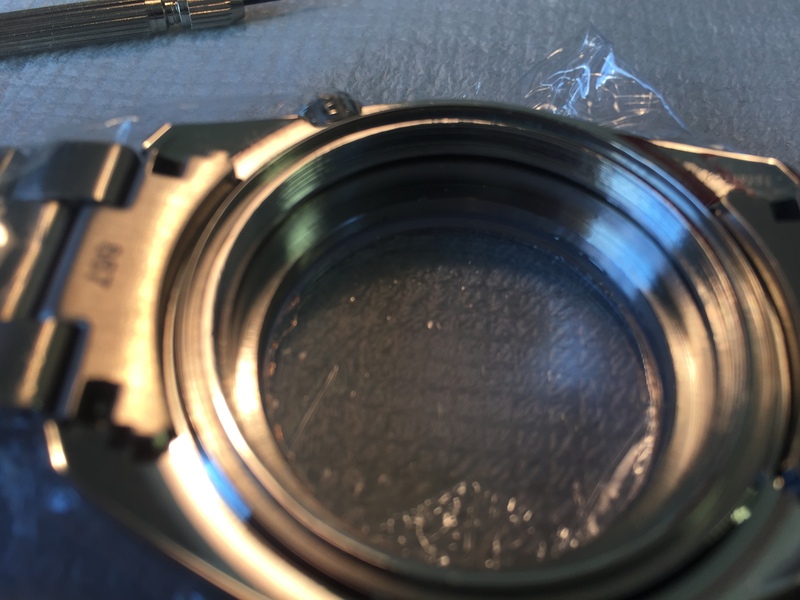 The gasket is dry as in the DG2813. I take the gasket out and put it into a silicone bath. 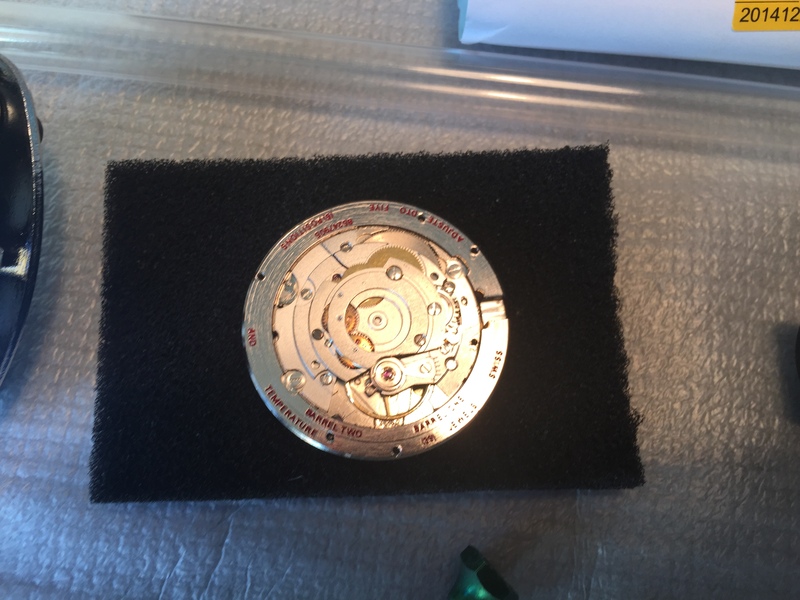 I remove the three screws that hold the movement in place (with little washers) and the rotor. 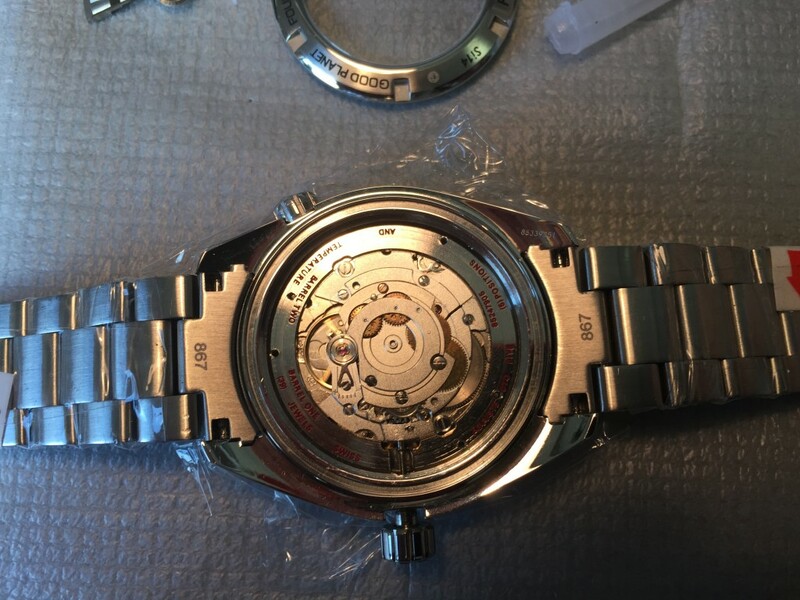 I then remove the stem and get the movement out (turn the watch around and tip it gently into my gloved hand). I want to make it clear that while it is true that the movement is face-down, it is (a) on a very soft cushion and (b) the movement is not running, so the seconds hand is not moving and is thus not under strain. 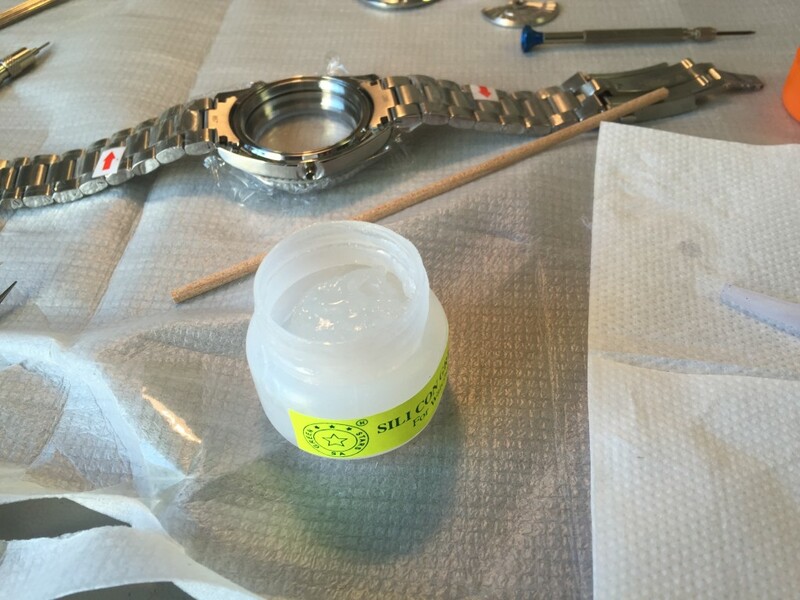 I then apply G-S glue to the front crystal. 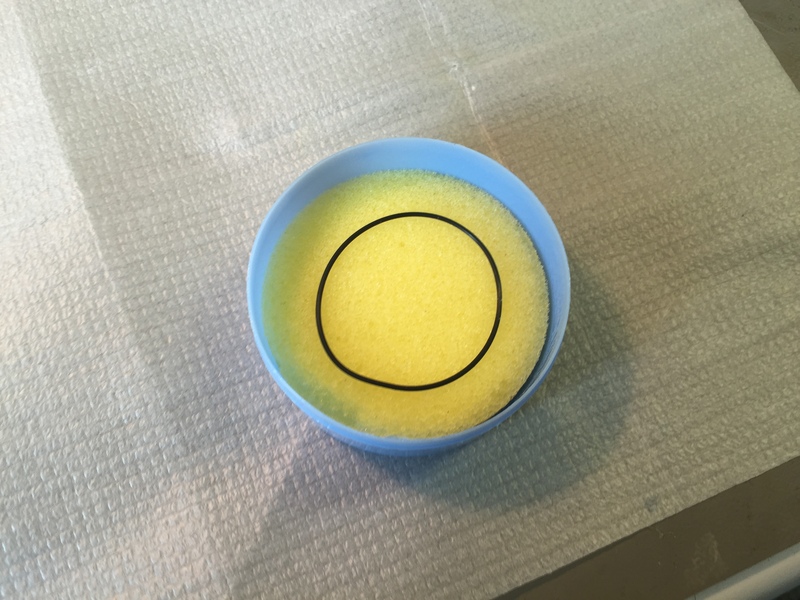 I use pegwood and rodico to remove any residual G-S glue. I then notice (see the pic above) that there is absolutely no opening for the HeV. That is brilliant, because I do not need a Helium release Valve anyway and now I do not even need to close it down with marine epoxy. 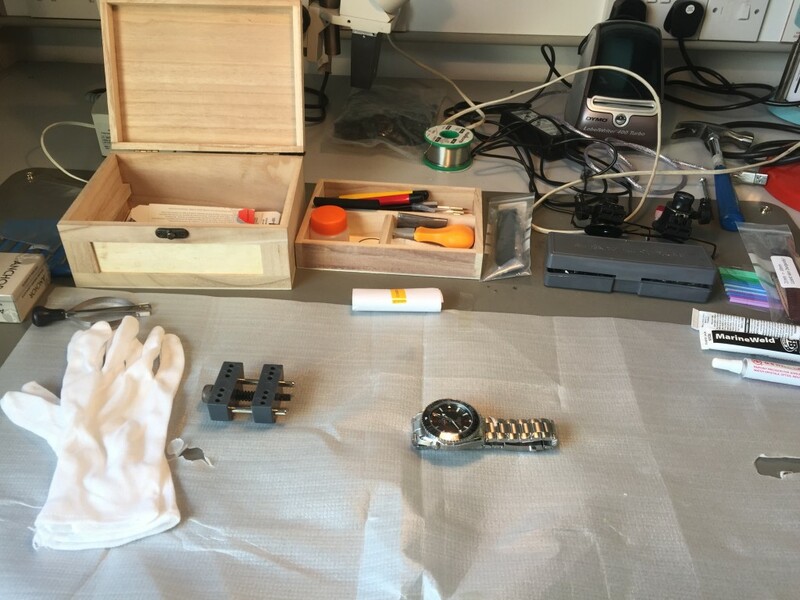 I now do not need the movement to be outside the case any more. While I am here, I am going to grease everything. 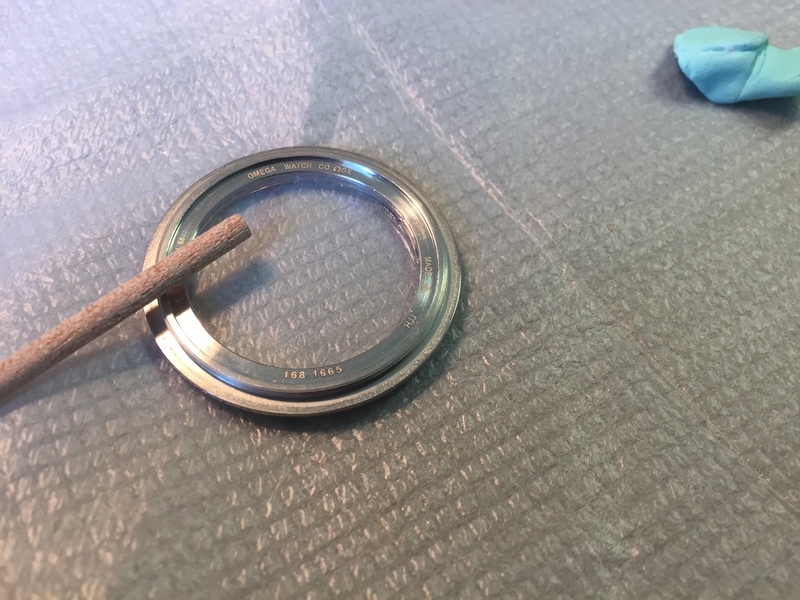 I use the silicon grease and a fine brush to grease the stem tunnel, the crown and the gasket groove. 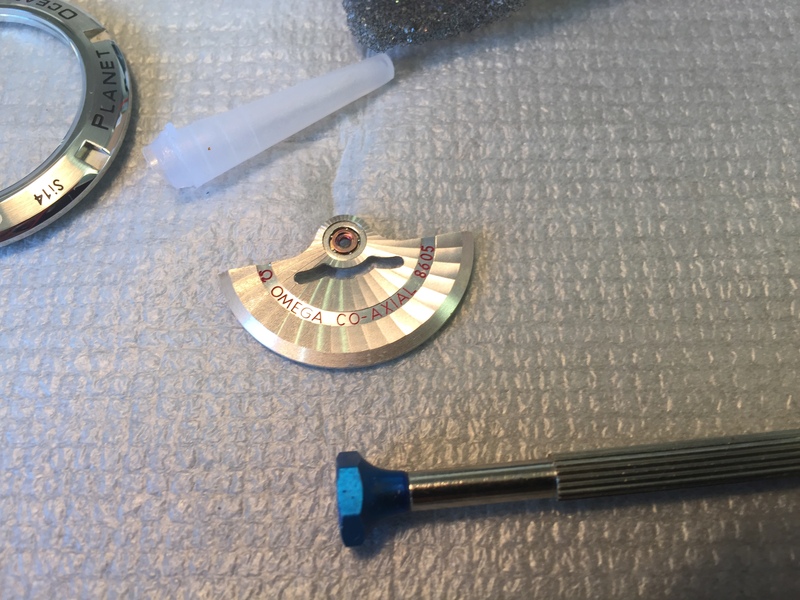 Before I put the movement in and attach it, I notice that there is a grey smudge on the rotor edge. It was not me! I used cotton gloves and I was handling the rotor with tweezers. I use rodico, pegwood, watchmans brushes and soft cloth to remove the smudge. I was not completely successful, but it is a lot better than it was. I then put the movement in and re-attach the rotor and the washers. And the stem, of course. Before I am done, I need to apply G-S glue to the display window in the back. I do exactly the same thing as I did with the previous watch. 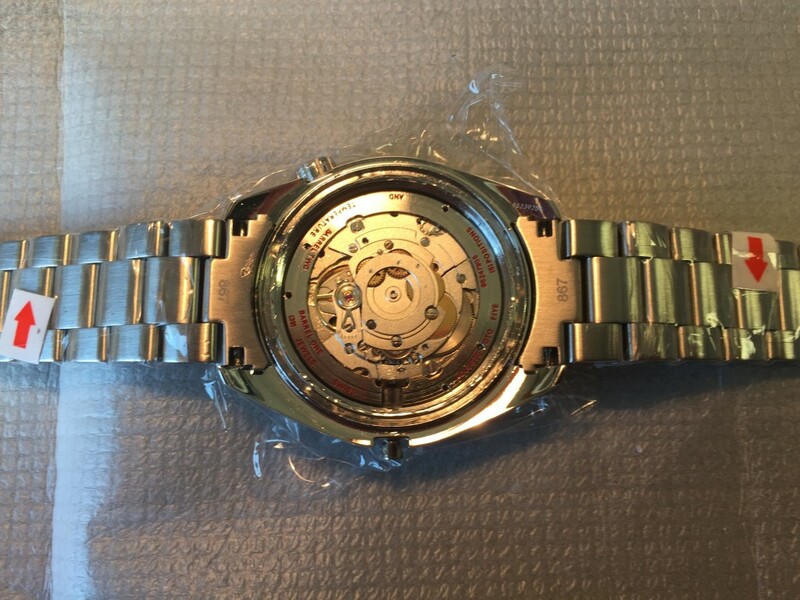 I close the watch down, remove the wrapping … and realise there is a smudge on the inside of the front Sapphire glass. Doh! I know that I must fix this now, otherwise I will never fix it and it will drive me insane. OCD FTW. 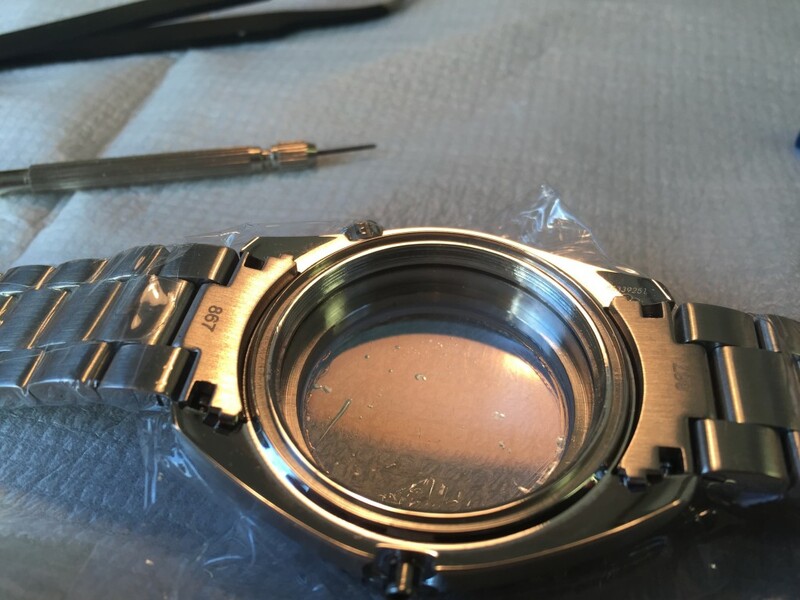 I open everything up, remove the stem, the washers, the movement and clean the glass. I then reverse the whole procedure and re-grease the gasket. I close the watch up and now the smudge is gone. 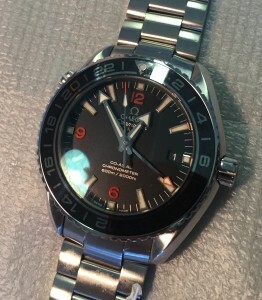 I need to take the watch into town and have it tested. UPDATE. Had the watch tested. Water-resistant to 100m! Woohoo!